There are few things more potentially devastating in sports than having your balloon burst just seconds after you’ve inflated it. The halfway point of the 19th minute of Tuesday’s bout between the Bulldog soccer team and NMMI at the Mack Chase Athletic Complex found the ‘Dogs with a corner kick opportunity. 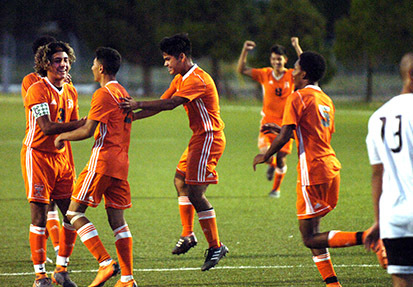 They succeeded, with help from senior Carlos Martinez, in landing the ball in front of the net, where – in the midst of the ensuing scrum – freshman Darius Bishop found it, booting in a goal to put Artesia on top 1-0. The boys in orange were elated, but just 29 seconds later, NMMI’s Jordany Bayonne-Kenol was able to slip past an Artesia defender and fired one in past diving keeper Aaron Natera to tie the game. It was a kick in the stomach, but rather than spend the remainder of the contest gasping for air, the ‘Dogs regrouped at halftime and came out just as strong in the second 40 minutes. Five minutes in, Martinez was tackled in the box by the Colt goalie, giving the Bulldogs a penalty kick. Senior Tomas Gonzales proceeded to hammer it home to put Artesia back up, 2-1, this time for good. “The team that played last night, our team, was a completely different team than we’ve seen in previous games,” head coach Phillip Jowers said this morning, “both mentally and position wise. There was a lot more chemistry. The ‘Dogs had another solid chance to get on the board in the 28th minute of the second half when a follow-up on a header nearly found net. 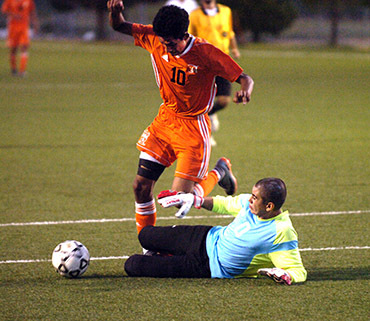 Artesia got a corner kick off the miss, but it was saved. A combination of solid play on defense and at midfield, and continued pressure by the offense helped stave off the Colts, however, even as they stepped up their aggressiveness late in the game. Artesia finished with 12 shots on goal on the night to NMMI’s eight. The Bulldogs (3-4) will now prepare to embark on a three-game road trip that starts Thursday in Hobbs with a 6 p.m. rematch against the Class 5A Eagles. 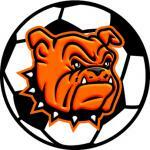 Artesia fell to Hobbs 6-0 Aug. 28 and will be looking for an improved performance. Following that contest, they’ll had to Clovis Saturday for a 3 p.m. game against the 5A Wildcats, then to Carlsbad at 6 p.m. Tuesday for Round One of the Eddy County War Soccer Series. “I was really pleased with the way we came together as a team yesterday, the way we moved the ball on the field, and the overall attitude in that game,” Jowers said. “We really worked on syncing it all up and trying to have that fluid movement throughout the game, having our minds match our bodies.